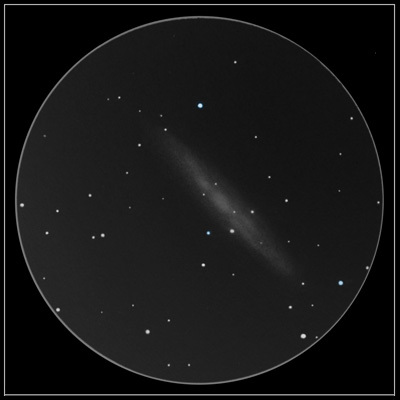 The “Sculptor Galaxy” (or slightly less familiar – “Silver Coin” galaxy) is one of the most bright and striking galaxies, coming second only after objects like M31, M33, M81. It’s a close, large (almost as large as the Moon), and almost edge-on spiral galaxy. In the eyepiece – the “Sculptor” has a long elliptical shape, and slightly assymetrical. Several darker and brighter filaments are clearly visible around the brighter central part, even in moderate instruments. Object Name : NGC 253 – the Sculptor Galaxy . Object Type : Spiral galaxy. Location: Negev desert, Israel, ~6.7 mag. sky. Instrument: 200mm F/5 Orion (US) Newtonian, 13mm Vixen LVW eyepiece. Beautiful Michael, great detail for an 8″ as a result of superb skies. I struggle with this from 52 deg north so thanks for sharing. Yes, nice detail and very realistic. Really great sketch! Thanks, man. Wonderful sketch of this nearly edge on galaxy. I like the detail in this dusty galaxy sketch.